In this level our advice is to clear the infected blocks as soon as you can and don’t let them to expand (to our opinion if infected blocks get expanded it will be more difficult to pass it). Besides a key point to complete the level is not to leave any blocks at the left part of the screen, without clearing them. Keep the line blasters for the final phase of the level. 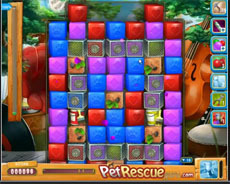 To beat pet rescue level 525 demands a specific strategy. We present it to you in the following vid.